Caste Certificate in Telangana - Procedure to Apply, Meeseva Caste Certificate in Telangana, Caste Certificate in Telangana, Apply for Caste Certificate in Telangana: Caste certificate is a proof of belonging to a particular tribe. And as we are in India this is very important. The main importance of caste certificate is to get some help from central and state government. Many people have an idea about this caste certificate and they are using all the benefits provided by the government to them. But there are many people in Telangana who don't have any idea about this caste certificate. So people who belong to scheduled caste, scheduled tribe, and other backward castes can read our article to take the benefit of these schemes from the government. 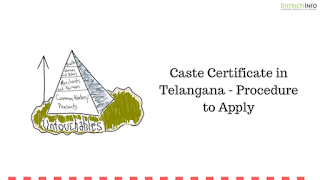 So here in our article, Caste Certificate in Telangana - Procedure to Apply we will tell all the details about this caste certificate in Telangana. Also, see how to apply for Income Certificate in Telangana. As the Indian government is trying to develop these backward caste people in the same as other caste is developing. That's why they are providing so many amenities to these people. According to Indian system, these people need some privileges in every field like there will be some reserved seat, some special discount, etc. Also, this caste certificate will act as a proof for these people and we have seen that at many places they ask for caste certificate as they need some proof. So for caste certificate in Telangana, you can apply online or offline for it. In our article, Caste Certificate in Telangana - Procedure to Apply we will notify you with every detail for caste certificate in Telangana. * Date of birth certificate like 10th class admit card, etc. * Residence Certificate of your residence. * Identity Proof like voter id card, driving license, aadhaar card, etc. * Address proof like aadhaar card, driving license, etc. * Income tax return certificate if possible. * Click on the official link of Meeseva Services. * Choose the application form according to your caste from the table below. * Download the application form and print it. * Now fill the application form without any mistake and overwriting. * Now just take the print out and attach the documents required. * Now go to the nearest Meeseva center and submit the form there. * They will submit it online for you. * Now this application form will be sent to Tehsildar's office for further process. * After submitting to Meeseva center you will get a receipt as acknowledgment number or registration number from the operator. * After successful submission of the form, you will get a text message on your mobile number which will have the transaction number and other details. * First you go to official Meeseva website to check your status of caste certificate. * Now fill your application number in "check meeseva certificate" box. * Click on go button. * Your caste certificate status will be online on your screen. This is all the information to obtain a cast certificate. Just read the article and follow the steps. Also, see Caste Certificate in Telangana - Procedure to Apply, Meeseva Caste Certificate in Telangana, Caste Certificate in Telangana, Apply for Caste Certificate in Telangana. You can also check about Single Women Pension scheme in Telangana.